It’s the first morning in the Southern Hemisphere, this in Dunedin, New Zealand. One is quickly reoriented to the reality that November 18, 2013 is summer in this hemisphere, and this means the days are longer than the November 15 days on the northern Great Plains of North America. Obvious, right? But not so much until experienced. 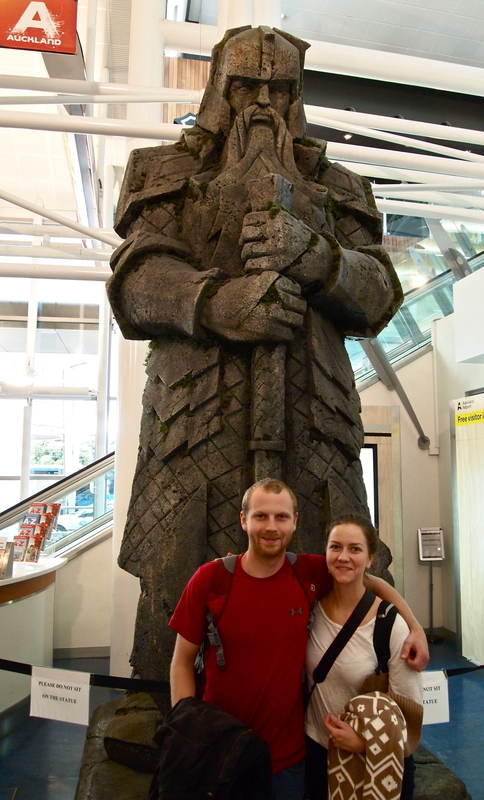 Matt and Molly stand below a modest Lord of the Rings statue at the airport in Auckland, New Zealand. The Lord of the Rings was filmed in New Zealand. We are a group of 5 from North Dakota. This includes Tom Isern (North Dakota State University) and Suzzanne Kelley (New Rivers Press, Minnesota State University Moorhead), who will be attending and presenting at the New Zealand Historical Association‘s biennial conference (I’ll be presenting at this conference, representing North Dakota State University too; much more on that in the coming days). It’s also great to have Molly (my girl) and her brother, Matthew, along, as they are going to drop in on some of the conference activity but direct most of their energies to take in the New Zealand south island senses of place. Our group originated from Fargo (Matthew got a ride from his sister, Mira, over from Valley City that morning). Our friend Jay Krabbenhoft took us to Fargo’s Hector airport, and we boarded a flight to Chicago; then to Los Angeles; and then to Auckland, this in the northwestern north island of New Zealand; then one last flight to Christchurch in the northeastern part of the south island. From there the flights stopped, and we took to automobile. At the airport, Tom and Suzzanne’s friends Kevin and Margaret O’Connor met us, and we grabbed lunch and chatted with our welcoming party. Tom and Kevin have known one another for over two decades, and they had deep conversational backdrop to draw from. 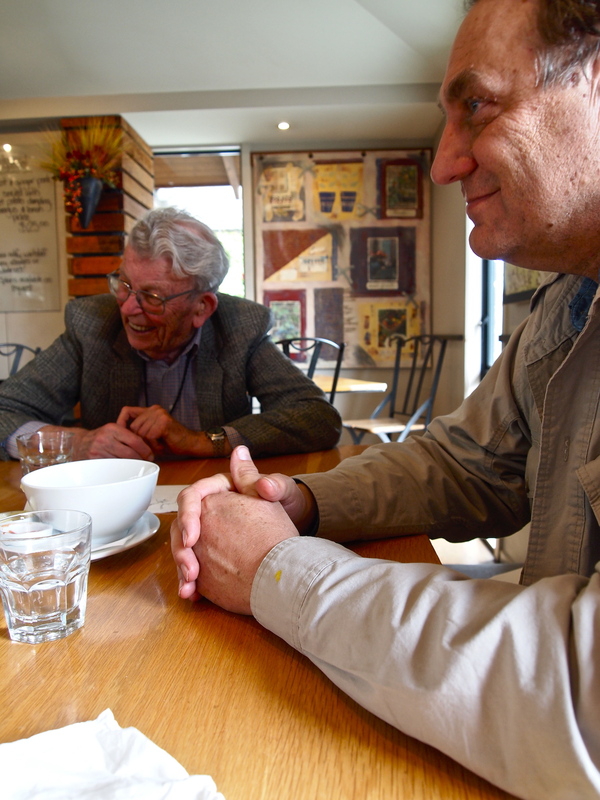 Common collegial souls Kevin O’Connor (l) and Tom Isern (r) catch up at lunch in Christchurch, New Zealand. After that it was a drive from Christchurch to Dunedin where the University of Otago is located (the southern-most university in all the world). 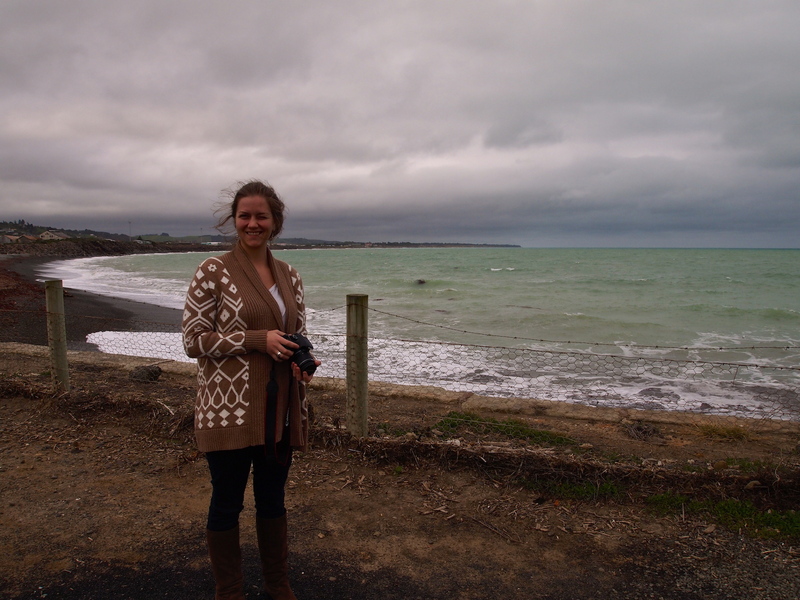 We stopped a couple places along the way, including the port town of Oamaru. The city itself has done a fantastic job of rehabilitating and restoring the port warehouse district into a place of bike shops, breweries, taverns, pubs and eateries. At the beach in Oamaru, we also saw a penguin refuge (it was the first time I got to view a beachside penguin refuge — totally off my radar up until this point). The penguins were nowhere to be seen, but it’s really hit or miss when they are there. (Note: New Zealand has a great variety of flightless birds, as the island lacks predators that find them tasty). So from Oamaru, we drove down to Dunedin, checked into our lodging, caught a bit of late dinner, and then let our heads hit the pillows. Molly and I on the penguin refuge beach in Oamaru, New Zealand. This entry was posted on Sunday, November 17th, 2013 at 12:27 pm	and tagged with New Zealand, New Zealand Historical Association, North Dakota State University and posted in Uncategorized. You can follow any responses to this entry through the RSS 2.0 feed.